What content is your audience consuming elsewhere? How can you attract readers and gain engagement? Ezyinsights Realtime gives you a view into the content your audience is reading and the pages they read it on. We monitor both websites and social platforms to deliver real-time metrics on engagement. When should you post on social? What should you post on social? EzyInsights unique Traﬃc Light means you’ll never again cannibalise your own engagement. Traﬃc Light is powered by our own learning algorithm that looks at engagement acceleration. It tells you when to hold oﬀ posting to ensure you reach maximum potential engagement on every post. Traﬃc Light is based on analytics and data informed insights to help you regulate post frequency and drive engagement. Your content is king and it deserves to be seen and heard. with and never miss a story. Be the ﬁrst to ﬁnd new emerging stories. We provide emerging news by the minute. Find out why EzyInsights is the fastest tool available and what that means for you. Get valuable and relevant data as soon as you log in. Zero set-up, no passwords, one click access. Get straight to the most important metrics. Custom ﬁlters surface content that is relevant to you. 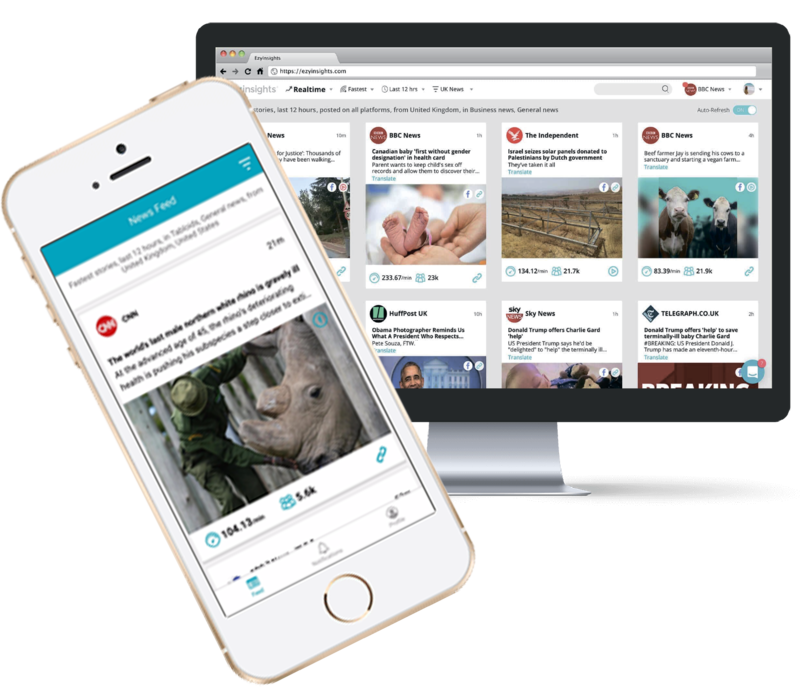 Unlimited ﬁlters mean a tool that scales up to the biggest newsroom with multiple publications. Set up alerts on important content and let the news come to you via push notiﬁcation, Slack or email. Never miss a story. Being easy to use is part of our core philosophy. Take a trial and see for yourself. “Since integrating real-time data in our displays, we can now say that we are truly data-informed. We’d be blind without EzyInsights.” Olav Haugan, Editorial Leader at TV2 Norway. Journalists and reporters are able to set personal ﬁlters to suit their needs. Find relevant content based on sources, categories, keywords, languages and more. Set up alerts and never miss a story. Find out how the article you’re reading is performing on different social channels with just one click. Ezyinsights is able for Android and iOS. Have your ﬁlters and alerts with you get notiﬁcations when news emerge. from Facebook, Twitter, LinkedIn, Instagram and Pinterest. 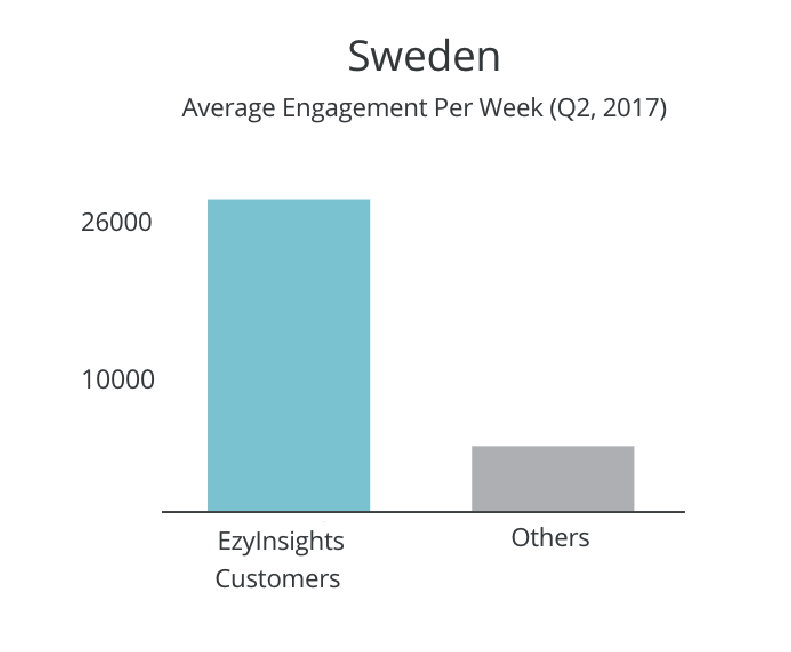 This example shows how publishers in the Netherlands perform compared to Ezyinsights customers. Typically our customers are able to improve their social and digital engagement by 100 % up to 400 % in less than a year. "Without Ezylnsights, our phenomenal growth at Newsner would not have been possible."